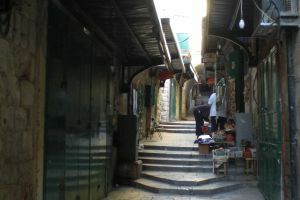 On the right of the street leading to Lions’ Gate, a slope goes up to the el-Omariyyah school; its courtyard serves as the starting point for the Way of the Cross. It is in the 16th cent. that the souvenir of the condemnation of Jesus was transferred from the Church of the Fagellation nearby to the governor’s palace (the turkish capigi-bashi). After all, it was logical for Western pilgrims to end up by identifying the residence from where the town governor administered justice, with the place from where Pilate had condemned Jesus. This is also the place of the herodian Antonia tower. Most of the buildings go back to the 14th cent (Madrasa al-Jawiliyya) or to the first half of the 19th cent. and were used for a long time as barracks before being rebuilt by the British as an Elementary school (1927). A construction encased in the southern wing is identified with the mediaeval “Chapel of Rest” or “Chapel of the Crowning with Thorns”. All that remains of this building, badly damaged by an earthquake in July 1927, is a section of wall and pieces of arcades, while sculpted capitals from Crusader times are preserved in the Islamic Museum. From the terrace the pilgrim has a good view over the Haram ash-Sharif. 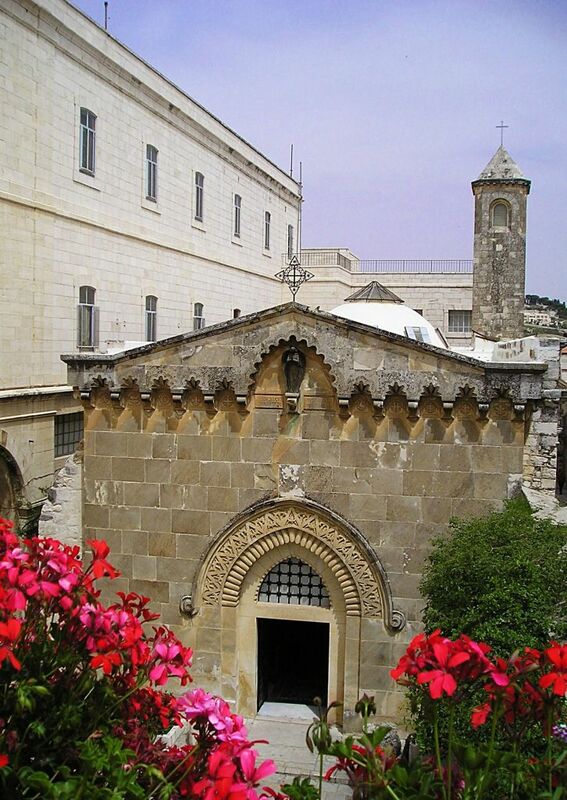 Situated opposite the Arab school, the convent of the Flagellation is the centre for a Scriptural and theological faculty, the Studium Biblicum Franciscanum, to which we owe important discoveries concerning the origins of the Church and the Holy Places. On the ground floor of the convent the Studium has a museum of archaeology where is also sited the new multimedia section Terra Sancta Museum – Via Dolorosa. 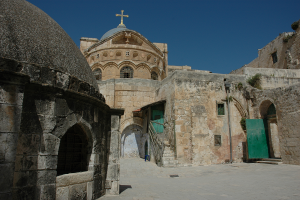 The church of the Flagellation (locally known also as Habs al-Masih or “Prison of Christ”) was built in the 12th cent. and has suffered then many avatars since the pilgrim’s reports mention it as a refuse dump, a stable,and a weaver’s shop. The place was a little more than a mound of ruins, when in 1838 it was granted to the Franciscans by the Egyptian Ibrahim Pasha, conqueror of Jerusalem. Hastily rebuilt in the following year thanks to the generosity of Maximilian of Bavaria, the church was entirely restored in 1927-29 by architect A. Barluzzi. The three magnificent stained glass windows in the coir are the work of L. Picchiarini after the design of D. Cambellotti; they represent the Scourging, the Washing of Hands and the Triumph of Barabbas (Matthew 27:24-26). The second chapel enclosed by the wall of the Franciscan convent unites the souvenirs of the Condemnation and of the Imposition of the cross. The chapel was built in 1903-1904 by a Franciscan monk, Br. Wendelin of Menden over earlier remains. Placed on its outside wall is the number of the second station, which before 1914 was located in front of the walled-up Mamluk gate, about 60 yards to the east. The wooden or papier-mâché statues in the chapel show Jesus during the first scenes of his Passion. On the south wall is a representation of St. John, trying to hide from the Blessed Virgin Mary the sight of Jesus carrying his cross. The floor of the chapel is made of large paving stones, some of which show grooves and games cut into the stone, just as on many Roman pavements. This pavement extends to the north of the building, as far as the museum area and the neighbouring convent of the Sisters of Sion. It is generally called the Lithostrotos (John 19:13), but with more probability belongs to the Aelia Capitolina of Emperor Hadrian (2nd cent. AD). 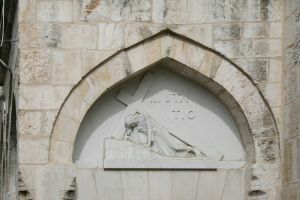 The Roman arch which spans the Sorrowful Way is one of the best known in Jerusalem for the role traditionally assigned to it in the story of the Passion of Jesus. The better preserved of its three arcades are the central one of which the greater part spans the Sorrowful Way, and the northern one, visible along with the remainder of the central one in the Ecce Homo basilica. The remains of the southern arcade have been incorporated into a private building. The modern setting-up of a loggia with two windows eventually encouraged the guides to see here the spot from which Pilate had presented Jesus to the crowd, and so to give to the arch the name Ecce Homo, latin for “here is the man” (John 19:5), which it kept till today. 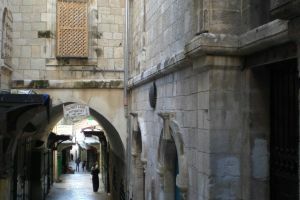 The grounds of the Convent of the Sisters of Sion stretch on the right side of the Sorrowful Way, from the Convent of the Flagellation to the Greek Orthodox “Praetorium”. The convent, built in 1857-1868 by a Jewish convert, Fr. Marie-Alphonse Ratisbonne, encloses the new Ecce Homo basilica, most of the pavement called Lithostrotos and a great underground reservoir identified by archaelogists as being the Struthion mentioned by Flavius, Josephus in his account of the siege of Jerusalem (The Jewish War, V, 457). The Greek Orthodox possess a part of the counterscarp of the Antonia, a section of the old street paving, and one grotto in particular which they show as the prison of Christ. An old greek tradition favoured the north side of the street as the residences of the High-Priests, Annas and Caiaphas (John 18:12). The House of Herod Antipas (Luke 23:6-12) is also a place found nearby, together with a putative Prison of Peter the Apostle. Beyond the Greek Praetorium the Sorrowful Way descends towards the Valley of Tyropoeon. 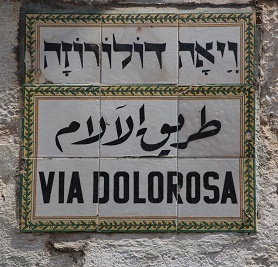 At the Valley crossroads the Sorrowful Way turns left, and for about 40 yards follows the street which comes down from Damascus Gate. Ever since Ricoldus de Monte-Crucis (1288), pilgrims link the junction of the two streets to a fall of Jesus and the requisitioning of the Cyrenian. Today the spot recalls the episode of the first fall. To the left, on the entrance of the former Turkish baths (Hammam as-Sultan), a chapel was built in the second half of the 19th cent. and renovated in 1947-48, thanks to the generosity of Polish soldiers quartered in Jerusalem. In front is an iron railing, its pillars are made from two pieces of a column which before was laid on the ground, and marked the actual spot of the station. A door, over which stands a bas-relief by the sculptor T. Zielinski representing the meeting of Jesus and Mary, leads to the building of the Armenian Catholics who own the third and fourth stations. The construction of their church at the back of the forecourt revealed in the second half of the last century, ruins of a building which would date back to 13th cent. On the site of the southern apse, the excavators brought to light a fragment of a fairly delicate mosaic, dated from 5th-6th cent., decorated with a design of two black sandals. This chapel appears to coincide with the church of Our Lady of the Fainting (Sancta Maria de Pasmason), mentioned by the mediaeval pilgrims. Some have quite naturally concluded that the sandals in the mosaic, marked the spot from where the Blessed Virgin had witnessed the carrying of the cross. The present chapel serves as crypt to the church of the Armenian Catholics. Untill few years ago the fourth station was commemorated a few yards further on, on the Sorrowful Way near the opening of an alleyway. Before turning to the right in the direction of Calvary, the pilgrim sees before him on the left, a house which bridges el-Wad Road: it is the supposed house of the Evil Rich Man (Luke 16:14-31), mentioned since the 14th cent. Just at the bend of the Sorrowful Way, we find the location, dating from the 15th-16th cent., of another house, of Simon the Pharisee, where a sinful woman anointed the feet of Jesus (Luke 7:36-50). About 1850, the place was chosen to commemorate the requisitioning of Simon the Cyrenian, who was compelled to bear the cross of Jesus (Mark 15:21), and in his memory the Franciscans have set up a small oratory. A succession of flying-buttresses makes the third part of the Sorrowful Way one of the most picturesque sites in Jerusalem, where since the 15th cent. 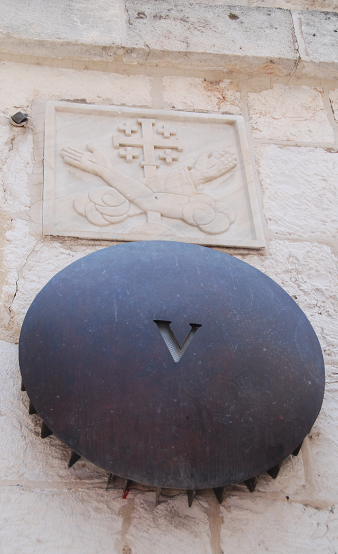 tradition places the house of Veronica (an approximate Latin spelling of the Greek name Berenikes). 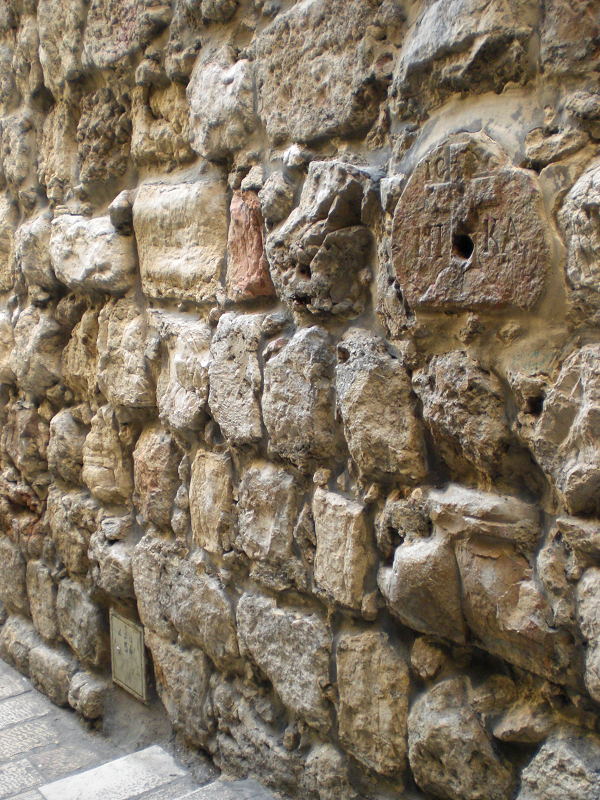 The sixth station is shown on the left by a piece of pillar embedded in the wall of a house which bridges the street. The site, which was bought at the end of the last century by the Greek Catholics, comprises an upper church and a crypt. It has ancient remains which could have been water reservoirs during the last centuries, and which can be linked to a Byzantine oratory said of Saints Cosmas and Damian. The “house of Veronica” is today that of the Little Sisters of Jesus, a religious congregation inspired by the life of Blessed Charles De Foucauld. The Sorrowful Way continues to rise and it rejoins the suk of Khan ez-Zeit (“the market for oil”). This crossroads is also the meeting-point of the cardo maximus (the main street) and one of the decumani(transverse roads) of Hadrian’s Aelia Capitolina. Since the end of the 13th cent. the pilgrims place here the gate where the authorities used to announce and publish the sentences of the courts, and through which passed the road to Calvary: the “Judgement Gate” (Porta Iudiciaria). Today the place is associated with a fall of Jesus, according to Burchard of Mount-Sion (1283). The Franciscans who own the site since 1875, built there in 1894 two superposed chapels where a large pillar of reddish stone is kept, part of the remains of Aelia Capitolina. After crossing the suk the Sorrowful Way continues upwards for about 20 yards, along its left side is the German hospice of Saint-John, decorated with a Maltese cross, and the Greek convent of Saint-Caralambos. 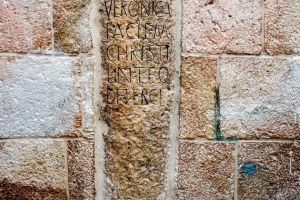 A stone embedded in the wall of this latter building has a Latin cross and the words in Greek, “Jesus-Christ conquers”: It marks the Gospel incident of the Daughters of Jerusalem who bewailed and lamented Jesus’ fate (Luke 23:28). This episode has been located in different places throughout the centuries, and it was only in the middle of the 19th cent. that the Franciscans moved its souvenir to beyond the “Judgement Gate”. The pilgrim retraces his steps as far as the crossroads of the station VII, and turns right into the suk. This roundabout way is due to the constructions added later, after the death of Jesus. But shortly another turn to the right is necessary, up the wide stairway and the winding road leading to the ninth station. The shaft of a pillar encased in the wall of the Coptic Patriarchate, marks here the third fall of Jesus. 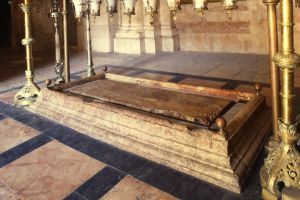 The rest taken by Jesus, or the fall he would have suffered as he neared Calvary, were originally located in the courtyard itself of the Holy Sepulchre, on the spot marked by a stone with a cross engraved on it. On the left is the shelter of the Ethiopian monks, which sits on the remains of the Constantinian basilica (Martyrium). 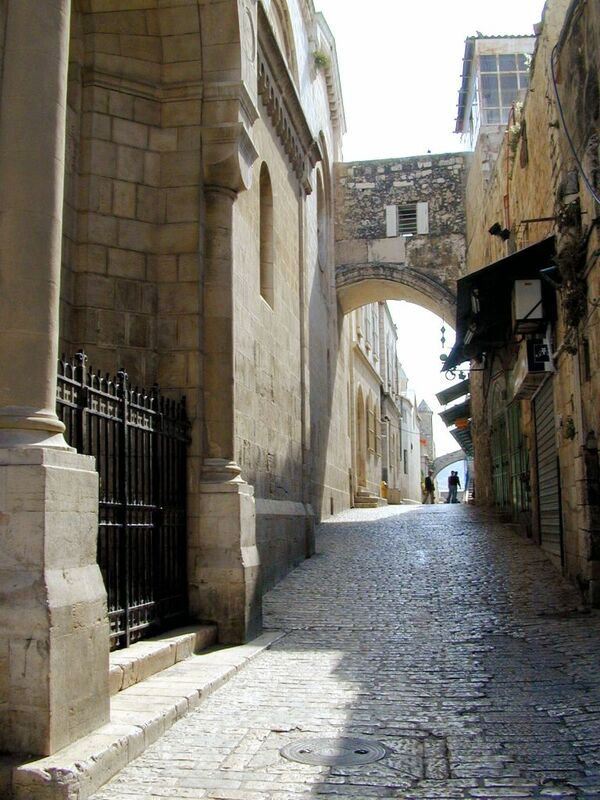 From there a narrow passage leads directly to the plaza in front of the church of the Holy Sepulchre. Otherwise the pilgrim must retrace his/her steps to the street in the bazaar. 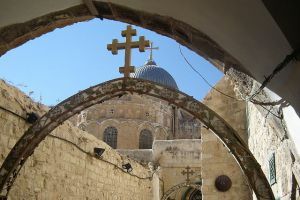 The church of the Holy Sepulchre contains the last five stations of the Way of the Cross and includes Calvary and the tomb of Jesus. Having entered the church, the pilgrim goes at once to the right and up one of the two stairways to Calvary. A great part of the platform of Calvary rests on an infrastructure; only the eastern part of the nave on the left is built directly onto the rock. 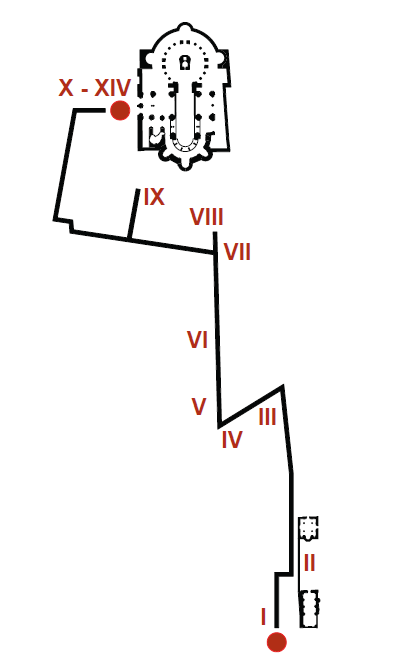 The tenth station is made at the beginning ot the nave on the right. The souvenir of the stripping of the garments (Matthew 27:35) had only appeared in Jerusalem at a late period. A few yards only separate the tenth and eleventh stations. The pilgrim is here in the Latin nave, restored in 1937 by A. Barluzzi. The mosaics in the ceiling are the work of P. D’Achiardi, who has preserved a mediaeval figure of Christ. The altar of silvered bronze is a gift of Ferdinand I de Medici. It is claimed to be the work of the Dominican Domenico Portigiani (1588) and was originally meant for the stone of the Anointing. 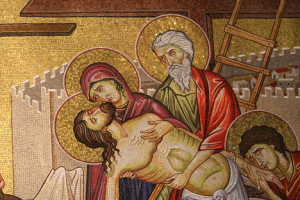 Panels on it represent the scenes of the Passion. On the right, a window protected by a grill opens onto the chapel of the Franks, dedicated to Our Lady of Sorrows and Saint John. Tradition makes it the place to where Mary withdrew, during the preparations for the Crucifixion. Tradition places the erection of the cross and the death of Jesus in the eastern part of the nave on the left. A silver disk with a central hole, underneath the Greek Orthodox altar, marks the spot where the cross, would have stood. This is probably the spot where in Constantinian times stood the wooden cross, replaced in 417 by the Emperor Theodosius II with another of gold and precious stones. To the right of the altar under the glass surface is seen the cleft that an old tradition links to the earthquake mentioned in the Gospel of Matthew (27:51). The Latin altar of the thirteenth station is placed between the two preceding stations, and is decorated with a wooden bust of Our Lady of Sorrows offered by Portugal in 1778. In Jerusalem the scene of the taking down from the cross was usually linked to that of the anointing, and located to the west of Calvary on the spot where, before the Crusades, stood the chapel of Saint Mary, and where the so-called stone of the Anointing has been venerated since the end of the 13th cent. This stone covers the rock on which the body of Jesus would have been laid (Matthew 27:57-60). 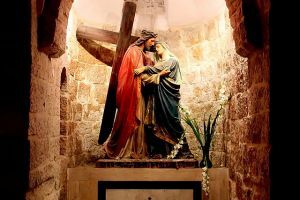 In order to reach the Sepulchre, the pilgrim descends from Calvary, passing by the stone of the Anointing and near to a circular slab surmounted by an iron cage: from this latter spot the holy women would have looked from afar at Jesus on the cross (Matthew 27:55). 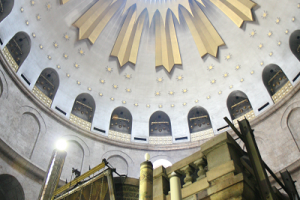 The Sepulchre stands in the middle of the Rotunda, known by the greek name Anastatasis (Resurrection). It comprises the chapel of the Angel and the funeral-chamber itself. As it stands today it is a Greek restoration dating from 1810. The chapel of the Angel replaces the original lobby of the tomb. According to tradition, the marble pedestal standing in the middle, is said to contain a fragment of the circular rock which was used as door to the tomb. A small arched opening leads from the chapel to the funeral-chamber. Since the destruction by al-Hakim in 1009, only the lower parts of the chamber subsist. The remainder is hidden by a marble facing. A marble slab, marked by a crack all the way across, was placed over the northern bench in 1555 by the Franciscan Boniface of Ragusa, Guardian of Mount-Sion. The empty tomb of Jesus remains as witness to his glorious resurrection (Matthew 28:6). This is a revised summary of a chapter from the valuable book by A. Storme, “The Way of the Cross”, Jerusalem 1984.